Brewers manager Ron Roenicke met with reporters Tuesday at the Winter Meetings in Lake Buena Vista, Fla., discussing a wide variety of topics from Ryan Braun’s return to the fifth spot in the starting rotation. 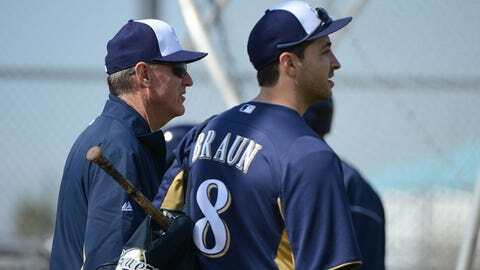 Starting with Braun, Roenicke again reiterated his belief that his star outfielder has said enough and doesn’t need to provide details of his use of performance-enhancing drugs. "This is a really good young man," Roenicke said. "He made a mistake, but this is a really good young man. If you are okay with people making mistakes, which I certainly am, you’ve got to look at what kind of person this guy is. This is a good guy." Braun recently appeared in front of the Milwaukee media for the first time since accepting and serving a 65-game suspension from Major League Baseball for violation of the league’s joint drug prevention and treatment program but didn’t get into specifics. A statement he released after the suspension said he used a "cream" and "lozenges" to get over an injury which he refuses to specify. "I think what happened with him going back to Milwaukee was a nice step for him to take, but also the more I think about it, anything he says at this point about what happened is never going to satisfy everybody," Roenicke said. "All’s it’s going to do is start up new controversy. It’s going to come across negative to somebody in the press, in the news. "And for him to have to go through that stuff again, to tell you the truth, I don’t think he needs to go there. If he wants to, fine. I don’t think he needs to go there. He can’t get real specific on everything, anyway. So I don’t think there’s a reason." Something Braun is going to have to deal with all season long, and maybe for the rest of his career, is the negative reception from fans. That’s something Roenicke knows is already on Braun’s mind as the season approaches. "He knows what he’s up against, and he knew last spring what he was up against," Roenicke said. "And I think the better he plays the more receptive that he’s going to be to everybody (at home). "On the road doesn’t matter. But it didn’t matter the first year that I saw him. That I was around him, he went to certain ballparks, and he was booed because he was a great player. I think part of it is going to be that and part of it is going to be what he goes through." As far as Braun’s new position, Roenicke said there have been multiple discussions about the move to right field and all parties involved are receptive of the switch. "I think Ryan enjoys being challenged," Roenicke said. "I think going to right field certainly is a new venture for him. He’s got the tool set to do it, no question. He’s got good speed. He has a very accurate arm, a strong arm and I think good judgment. I think all of that plays into a right fielder." Braun wasn’t the only topic discussed by Roenicke, as he also hit on a number of other baseball-related topics. The skipper revealed that Scooter Gennett will go into spring training as the team’s starting second baseman, leaving Rickie Weeks in a bit of limbo. Gennett hit .324 with six home runs and 21 RBI in 69 games with the Brewers last season, earning himself the job heading into 2014. "To say, ‘Scooter, you’re on the bench and Rickie is our everyday guy right now’, I don’t think that’s real fair to Scooter," Roenicke said. "We may end up needing both of them, you don’t know what’s going to happen, and we’ve got to get Rick back to where he was." Weeks, who suffered a season-ending hamstring injury in August, is owed $11 million next season in the final guaranteed year of his contract. Because he’s coming off a major injury, has declined drastically over the past two seasons and carries a big salary, Weeks isn’t someone the Brewers could move easily right now. "When I first came over in 2011, before he hurt the ankle, he was a tremendous player, leading off and driving the ball, getting on base, stealing bases," Roenicke said. "So hopefully we can get him back." Much like Gennett, Tyler Thornburg made an impression with his performance late last year and will enter spring training with a leg up in the race to be the fifth starter. The 25-year-old went 3-1 with a 2.05 ERA in 18 games and 7 starts for the Brewers in 2013, but allowed just seven earned runs in 43 innings as a starter. "I think you need to do it that way," Roenicke said. "Then we’ll see what these other guys can do. I think anytime you give a guy an opportunity to do that and he pitches the way he does, I think he needs to get the first opportunity." Roenicke also addressed the leadoff situation now that Norichika Aoki is in Kansas City. The Brewers don’t have an ideal replacement on the roster, but Roenicke feels Jean Segura, Carlos Gomez, Gennett or Weeks could fill the void. The concern with Segura and Gennett hitting leadoff is that they don’t work the count or walk much. Segura walked just 25 times in 623 plate appearances last year and Gennett drew 10 free passes in 230 plate appearances. "Scooter and Segura are basically on bases generated by their batting averages," Roenicke said. "So I hope they hit .320, then their on base is going to be .350. I guess that’s what we’re hoping."